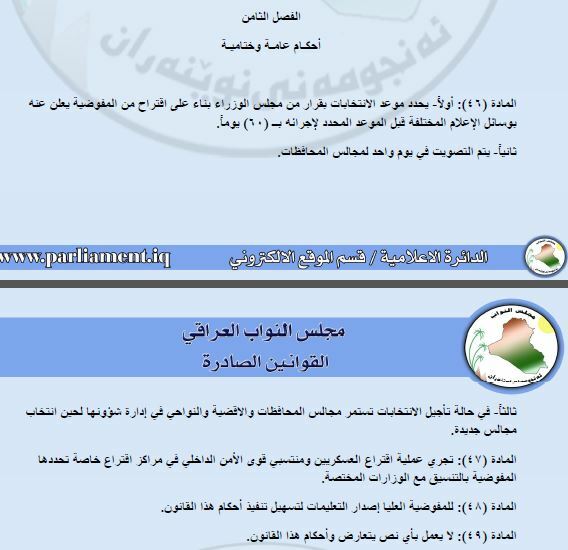 It is interesting that the list specifically describes the absence of all the deputies of the Kurdish bloc and its allies – altogether 59 deputies, including 2 Chaldeans and 1 Shabak – as relating to a “political boycott”. For the remainder of absent deputies, there are ostensibly other reasons, although a glance at the statistics reveals some interesting tendencies. Starting with the Shiite alliance, out of its 28 absent deputies, no less than 10 are Sadrists, which could perhaps be seen as something of a political protest. But note that the State of Law bloc of Prime Minister Nuri al-Maliki has also 10 deputies absent! Turning to Iraqiyya, again the Wifaq bloc of Ayyad Allawi stands out, accounting for 8 of the 23 absent MPs. But other blocs including more pro-Maliki ones are also absent, with for example 3 from the Mutlak bloc and 2 from the Karbuli bloc. Also noteworthy is the absence of 6 deputies from pro-Maliki Iraqiyya splinter groups like Free Iraqiyya (4), White (1) and Wataniyun (1). Iraq being Iraq, it refused to stand still for the start of the 10-year war anniversary. As Americans began marking the day when President Bush declared war, Iraqi newswires were awash with reports that local elections scheduled for 20 April had been postponed for a maximum 6 months throughout the country for security reasons. Subsequent reports qualified the initial once and said only the Sunni-majority governorates of Anbar and Nineveh would be affected, although there has so far been remarkably little in the way of official, written confirmation. Nonetheless, the epic timing of this decision immediately raises questions that are highly relevant to the outpouring of punditry assessing the war: Was the derailment of elections simply the most symbolic indicator possible that Iraq’s transition to democracy has failed? Not so fast. Some theories immediately thought the cancellation of the elections in Sunni provinces bordering Syria was a response by Prime Minister Nuri al-Maliki based on fear that radical Sunnis would come to powers in large numbers – thanks mainly to the general radicalization of the political atmosphere in those areas, which are seen as largely loyal to the Syrian opposition. But there is evidence going back several weeks that local politicians in Anbar had in fact contacted the Iraqi elections commission IHEC exactly with such a postponement in mind. Subsequent to the news that the Iraqi cabinet had decided on a delay, those local politicians went on to express satisfaction about the decision to postpone. To some extent, of course, this could be simply the result of some politicians fearing they would lose their jobs due to popular dissatisfaction. Turning to Nineveh, though, there is a different picture altogether. The outcry against the postponement has been loud there, and here Usama al-Nujayfi, the parliament speaker and brother of the Nineveh governor, condemned the delay. Evidently, the Nineveh politicians are far less afraid of losing their jobs than their Anbar counterparts. This may be performance-related, but it could also have to do with different views on the Syrian uprising and the radicalism it has brought to Sunni-dominated parts of western Iraq. Anbar has after all seen some of this before: The sahwa movement was a response to unwanted radicalism on the part of Al-Qaeda. Last year, Maliki succeeded in winning over a sufficient number of local shaykhs to dilute a movement in favour of federalism for Anbar. What we are seeing today in terms of rapprochement over elections postponement could be much-needed tendencies of cooperation between Maliki and Sunni local leaders at a time when regional winds are clearly blowing in a sectarian direction. With many Iraq commentators focused on black and white characterizations of Iraqi politics (or “crescents”) we tend to forget that many Iraqi Sunnis still find themselves sandwiched between extremist Al-Qaeda sympathisers and an Iraqi government they suspect of having too close links to Iran. Nineveh appears to be a different story, thus cementing the sense of a complete rupture between Maliki and the Nujayfi brothers. Some Maliki critics in Nineveh go all the way and call for federalism as an appropriate response. Still, the stark discrepancy between the Nineveh and Anbar responses should in itself give pause for those in a hurry to declare any kind of Sunni region. If Maliki is smart, he will take this last-minute opportunity to win some much-needed Sunni friends in Anbar. Already the Sadrists that saved his premiership last year (and the budget earlier this month) have declared a cabinet boycott, saying they take orders from Muqtada al-Sadr only. That sort of capriciousness should be a reminder to Maliki about what sort of forces he will be hostage to if he perseveres with a strictly sectarian approach in order to guarantee his political survival. Exactly as in the 2010 parliamentary elections, the release of official candidate lists for the 20 April local elections is a two-tiered process. An initial batch of approved candidates – the majority of 8,099 vetted candidates – has been released first. Candidates that have been struck from the lists due to problems with their candidature have their names suppressed in the first list, but they can appeal. If they succeed, they will appear in an addendum to the official candidate lists, to be published by IHEC separately. Also like in 2010, it is possible to use the statistics of omitted candidates from the released lists of candidates as an indication of de-Baathification issues and how they affect different political entities and geographical regions of Iraq. True, omitted candidates also include a minority of people whose exclusion may relate to other factors, such as criminal charges or forged documents. There are also a host of other methodological issues to keep in mind. Nonetheless, since the majority of the omissions appear to relate to de-Baathification, these statistics do offer a sufficiently distinctive picture to say something about how people’s relationship with the old Baathist regime are still having an impact across Iraq . The picture that emerges from a tabulation of this data is quite clear, and very similar to 2010. In terms of party allegiances, the Shiite Islamists and Kurds generally have few problems with de-Baathifications. It is noteworthy that whereas Prime Minister Nuri al-Maliki did have some de-Baathification issues in 2010, this time his lists have been mostly untouched by the de-Baathification committee. On the other hand, the secular and Sunni-dominated parties are represented disproportionately among the entities targeted for de-Baathification. Iraqiyya stands out, accounting for the lion’s share of all likely de-Baathification cases. A similar fate has befallen some (but not all) of the Iraqiyya splinter groups, a case in point being Free Iraqiyya. (Conversely, White, the mainly Shiite breakaway group from Iraqiyya has apparently not experienced any nomination trouble at all.) The unwavering cross-sectarian partisans of Nadim al-Jabiri and Mahmud al-Mashaddani have only managed to put up a list in Baghdad; it too seems to have a few cases of de-Baathification. Three interesting but far less known entities are 429, 492 and 517. All of them stand out for making an attempt at running in several provinces, and all of them figure disproportionately among the likely de-Baathification cases. They include Wasfi Asi Hussein, the leader of list 517 who ran with Maliki in 2010; he is now contesting Baghdad and Anbar. Other local (i.e. one-governorate) lists with notable nomination trouble include 401 and 435. Geographically, it is also a well known story we are dealing with. South of Baghdad, there is now hardly any de-Baathification at all after an extra-judicial witch hunt of anyone with ties to the Baath blossomed during the months prior to the March 2010 parliamentary elections. The majority of de-Baathification cases are from the Sunni-majority areas as well as the capital Baghdad, with Nineveh taking the biggest share of the total. It is noteworthy though that the generally close ties between the northern regions and the regime affect even candidates on the Shiite and Kurdish lists. The few cases of Shiite de-Baathification issues that can be found arise in the north, and even Kurds in Nineveh appear to have problems getting some of their candidates approved. One final indicator worthy of consideration relates to the list rank of the de-Baathified and disapproved candidates. With respect to some entities – again often the Shiite parties – the few cases of excluded candidates that appear are far down the list and may relate to sloppy documentation and oversight by the party leadership who may not care that much what happens to bottom-of-the-list candidates. However, certain lists have seen their top candidates slashed in what amounts to highly symbolic moves against their leaderships. One example is the list of Iraqiyya politician Saleh al-Mutlak in Baghdad, which has yet to get its top candidate approved. (Maybe Mutlak’s reported support for Maliki recently in settling the budget against the wishes of the Kurds will help him once again.) Other such entities include list 429, which seems to be the personal creation of one Rushdi Saidi who is presumably the top candidate in Baghdad for whom approval remains lacking. Same story with 468 in Karbala and 505 in Diyala. These are lists and figures worth keeping an eye on simply for the fact that the de-Baathification committee finds it worthwhile to target them at the top. Of course, this year’s de-Baathification purge comes against the backdrop of the big controversy relating to Midhat al-Mahmud, the supreme court chief. Mahmud was recently himself subjected to de-Baathification, although the de-Baathification appeals board subsequently approved his appeal and reinstated him, saying they found no trace of any connection to the Baath. That is somewhat hard to believe given Mahmud’s elaborate CV of achievements in the judicial system of Iraq since the 1990s, but then again it would be an exaggeration to say that the de-Baathification law has been applied to the letter since it was passed in 2008. The political context of the reinstatement of Mahmud suggests the Sadrists caved in to Prime Minister Nuri al-Maliki in this case by letting the prime minister replace the Sadrist head of the de-Baathification board – and perhaps with the message that de-Baathification needs not be applied quite so strictly when it comes to Shiites. Recent Sadrist alignment with Maliki to get the budget passed despite the demands of the Kurds and the boycott of Iraqiyya is an indication of the same trend. Judge Midhat has quickly moved to reassert himself by sacking the court spokesperson and striking down a piece of legislation passed by the Iraqi parliament without consulting the government; the recent attempt to limit the term limits of the prime minister will likely suffer the same fate. Regarding this latest act of mass de-Baathification, the statistics speak for themselves as regards who is being hit. It should be added, though, that if the law had been applied evenly and if the appointment of the de-Baathification board had been less politicised there would probably have been greater numbers of disqualifications on both sides, among Sunnis and Shiites alike. Many ex-Baathists of either sect are probably able to run simply thanks to wasta (informal patronage) rather than fulfilment of the judicial requirements – consider for example how unscathed the list of parliament speaker Nujayfi is. A “state of law” it certainly isn’t. They have been long in the making but now they are finally published: The lists of 8,100 candidates for Iraq’s 20 April local elections. This is quite a substantial source of 200 plus pages of candidate names, but at least some initial conclusions can be drawn regarding how the battle is shaping up in the various provinces. One way of looking at the candidates and the competing coalitions is to study which political movements compete in all of the country, and which are limited to particular areas and regions. From that angle, it is clear that only one list fields substantial numbers of candidates throughout the country from Anbar and Nineveh in the north to Basra in the south: The secular Iraqiyya headed by Ayad Allawi. Even before the ballots have been cast, this must be considered something of a triumph for Iraqiyya (list 486), which has shown considerable signs of cracks and internal splits during the political turmoil following the US exit from Iraq in December 2011. Despite rumours of major defections as well as the emergence of actual splinter groups, Iraqiyya continues to muster candidates in Sunni and Shiite areas alike. Iraqiyya is the only major coalition to do so. Unlike the situation in 2009, the Shiite Islamist parties have decided to form one umbrella Shiite ticket in all areas where the Shiites are minorities (list 472 in Salahaddin, list 463 in Nineveh and list 501 in Diyala) and are not competing at all where there is no significant Shiite electorate (Anbar). A clearer message of sectarian disinterest could hardly have been formulated: These coalitions are no longer even trying to compete for the vote of people of a different sect, quite similar to the well-established ethnic strategy of the Kurds (list 469 across the northern governorates). As for the situation in the Shiite-majority areas south of Baghdad, it is shaping up as a three-way struggle for the Islamist vote between Muwatin or ISCI (411), the expanded State of Law coalition of Prime Minister Nuri al-Maliki that is now also featuring the Badr organisation and Fadila (419), and the Sadrist or Ahrar list (473). The rest of the field consists of two things: Firstly, coalitions who have tried to follow the Iraqiyya model of contesting both Shiite and Sunni areas, but without the ability to cover all of the country; secondly, local curiosities. To the first group belong parts of the Iraqiyya parliamentary bloc that have decided to run separately in the local elections, including most prominently the Mutahhidun (444) of parliament speaker Usama al-Nujayfi and his brother Athil, the governor of Mosul. In addition to Nineveh, this list is running in Basra, Baghdad, Salahaddin and Anbar. The inclusion of Basra makes it look like more than a narrowly oriented regional coalition, although the number of candidates it is fielding there (8) is unimpressive. Similar attempts to be national without really succeeding can be seen in Saleh al-Mutlak’s list (list 425 in Baghdad, Anbar, Salahaddin and list 466 in Muthanna) and among Iraqiyya breakaway elements like the pro-Maliki White (456, running only in Basra, Babel, Qadisiyya and Karbala) as well as Free Iraqiyya (list 467 running in Baghdad and Diyala and list 499 in Karbala). There are several local phenomena that will make for special dynamics in particular governorates. In Anbar, Allawi, Nujayfi and Mutlak are challenged by several lists with a more local orientation, as is the case in Salahaddin (including the list of the governor, 430). In many of the Shiite-majority areas, there are small independent challengers to Maliki, including an independent list in Basra run by a prominent businessman (432). Powerful local lists that helped Maliki win control in Karbala and Najaf in 2009 are still running separately there (434 and 441 respectively, though the Karbala governor himself is now on the Maliki list). One of the small Shiite Islamist parties, the Tanzim al-Dakhil branch of the Daawa, has elected to run separately in most governorates (list 460), and the shadowy, possibly pro-Maliki Knights of the Law Supporters (484) appear with small lists in Salahaddin, Wasit, Baghdad, Dhi Qar and Diyala. A couple of hundred candidates have been provisionally struck from the lists by the de-Baathification committee. This is a lower percentage than in the parliamentary elections of 2010, though a cursory reading of omitted candidates suggests it is once more the Sunni-majority governorates and the secular parties that are taking the heaviest toll. They still have the possibility to appeal the decisions individually, and a final roll of last-minute approved candidates will be published by IHEC. All in all, the candidate lists suggest a political atmosphere that is looking more sectarian than in 2009, with the Shiite parties largely giving up the fight for Sunni votes. To what extent Iraqiyya will actually succeed in its nationally oriented strategy, remains to be seen as well. Nonetheless, given Iraq’s increasingly homogeneous sectarian population patterns, the majority of these contests will be of an intra-sectarian nature. To some extent, the electorate will give their verdict on four years of rule by Maliki allies; these figures are now at the top of the State of Law list in their respective areas, including in places like Basra and Baghdad. The concomitant sectarian infighting can perhaps in itself have some positive impact on an Iraqi political situation that seems stalemated internally and under severe pressures from regional dynamics, above all in Syria.